St John’s in the Vale is a glacial valley in the northern part of the Lake District surrounded by some of the most striking and most popular of the Lakeland fells. The valley runs south to north set between the rocky flanks of Clough Head to the east and High Rigg and Lowrigg to the west. The southern end is a narrow pass between High Rigg and Great Dodd near Legburthwaite while the northern end widens to meet the valley of the River Greta near Threlkeld where the view north is dominated by the fells Blencathra and Skiddaw. St John’s Beck which flows northwards along its floor is the primary route of outflow from Thirlmere reservoir to the south. The valley is home to a number of farms, small villages and hamlets, several disused quarry and mine works and the Threlkeld Quarry and Mining Museum. Low Rigg is a small hill at a height of 277 metres (908.8 feet) standing just slightly north of its larger neighbour High Rigg. Although not very high Low Rigg’s summit provides wonderful views of the surrounding area and situated on its northern side is Tewet Tarn. Castlerigg Stone Circle situated about 1.5 miles south east of Keswick is a famous monument standing on a superb natural plateau which provides an outstanding all round view of the surrounding fells and also some of the highest peaks such as Blencathra, Skiddaw, Grasmoor and Helvellyn. The circle is one of Britain’s earliest stone circles dating back to the Neolithic period 4000 to 5000 years ago. It is made up of 38 free standing stones some up to 3 metres (10 feet) high. It may have been used as a trading post, meeting place for social gatherings, a site for religious ceremonies and rituals or an astronomical observatory with the stones being aligned to the sun, moon and stars. The entrance seems to line up with the midwinter sunset. Castlerigg Stone Circle was one of the first sites to be covered under the Ancient Monuments Protection Act in 1888 but has been officially protected since 1833. The circle was acquired by the National Trust in 1913. It is the most visited circle in Cumbria managed by both the National Trust and English Heritage. Admission to the circle and the limited parking is free. With Castlerigg Stone Circle on our right we head forwards along the tarmac road past the Keswick Climbing Wall Centre. At the end of the buildings we turn right following the public footpath sign over the field to the bridge. We cross the bridge and head forwards bearing right at the t-junction. After a short way we turn right at the next t-junction sign posted St John’s in the Vale. We follow the road for a short way and turn right at the public footpath sign into a field. We head uphill following the wall on the far side of the field. At the end of the field we go through the gap bearing right following the wall on the right. At the sign post we bear left and head forwards towards Tewet Tarn. We go through the gate, the tarn on our right, and head forwards slightly uphill then bear right slightly downhill to go through a gate. We now follow the path to the dip just to the right of the hill in front. We cross over a stile and keep following the path towards the buildings and a church. We cross over the stile and before we turn right down the tarmac track we take a look at the church. We follow the tarmac track with the wall on our right through a gate. We head forwards downhill and when the track bears left we keep heading forwards to go through the gate. We head forwards down the fields crossing over a little foot bridge to a sign post and track where we turn right. We follow the track then go through the gate at a wall corner and keep heading forwards until we meet the road. We turn right for a short way then turn right at the sign post, Castlerigg Stone Circle. We head forwards and after crossing over a cattle grid we turn left slightly uphill. We go through a gate and head forwards to go through another gate at the side of some buildings. We keep heading forwards through the fields and gates until we reach the tarmac road we started on. We now turn left to visit Castlerigg Stone Circle. This is an easy walk on fairly good paths and tracks through fields and a short section of minor road. There are some gentle inclines and declines. Elevation: approx lowest point 148.5m (487ft) approx highest point 255.40m (838ft). Approx 4.2 miles allow 2 hours using OS Explorer Map OL4, The English Lakes North Western area. Start Point: Car park at Castlerigg Stone Circle. St John’s in the Vale, east of Keswick in the Lake District, Cumbria. From the A66 take the A591 to Keswick. Just before the T-junction take the minor road on the left to Castlerigg Stone Circle. Free lay-by parking at side of road. 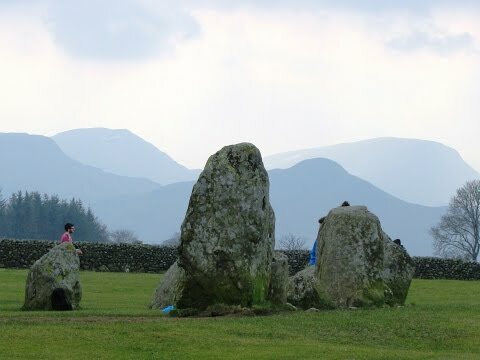 Parking: Free lay-by parking at Castlerigg Stone Circle. There are no public toilets or refreshments. The nearest facilities are in Keswick with plenty of shops, cafes, pubs, bakeries and take-away.